Habitat is where you find it, I guess. This was my gift from the universe this morning for schlepping to Lowe's. group of unruly hardware store addicted humans and towered over by giant roasting machines. Wish I could be that hopeful and that focused and fearless. It looks like she is trying to be invisible. 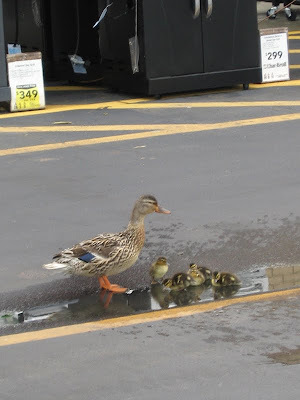 Like, if I stand really still no one will notice that my kids are taking a little swim...hmmm...I wonder where donald went?..... Course I know she was probably futzing around while you shot it. Good pic! Shows the wonderful nature of mothers in such a simple way.